Have you heard of Powtoons? Animatron? Well if you haven’t I am here to tell you just how awesome these websites are (also, free) and useful for your wedding invitations. 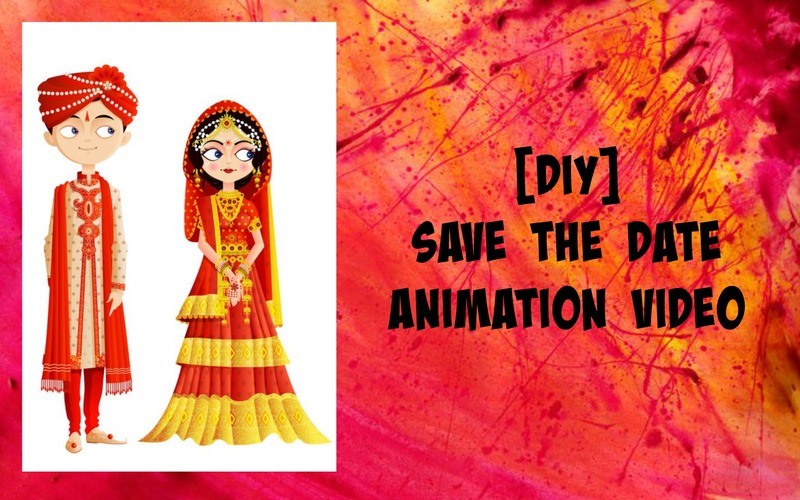 If you are looking for a DIY save the date animation video, have seen some awesome animation videos online and have no clue how to make one for yourself (free of cost), then keep reading this post. First, let me share with you what I made. I was looking for some inspiration online for a different blog post, and came across this concept. Immediately I was drawn to it, and bam 9 hours later, I had a rough video made up. Disclaimer: It does require a fair amount of effort, but its a lot of fun. So I know its not the best draft out there, and probably nowhere comparable to the agency made animation videos, but a personalized one always has its charm. You can make a video like this for your bff getting married, or even your sister or brother just the way I’m doing. So how to make this thing? I used the website Animatron for this project. But there are other websites too. Animatron is nothing but a animation website where they have characters and objects and lots of icons and backgrounds that you can use for free to make your video. Be it for your school, work or even for some personal use. I am usually more comfortable with Powtoons, which is another animation website…but this time I went with Animatron purely because of the characters. The characters that you see in the video, they are doing some actions which are already present on the website ready to be simply dragged and dropped. One doesn’t really need to make the cartoons do anything. This is also why my storyline revolved around what the characters were doing. So like eating, kissing each other, hugging…those emotions. I just had to revolve my story around the pre-animated cartoons. You can’t make them do something which is not available. So for instance, the cartoons on my video can’t be asked to play football, that’s not available on the website. Ditto with other sites as well. But, Animatron has a LOT LOT of options in characters and situations. Way more than even Powtoons. You should definitely check it out once. Start by making an account on the site. Its a free account and you should make it, because then it saves your animation video from the start. There is no fear of losing the work. Now, your main editing video page will open up. Take some time to browse through the options, and familiarize yourself with the page. You will see loads of *animated sets* which are nothing but a set of character family and the various activities they are doing. So for instance, my character family is Dani & Jordi. They are a couple in love. All the activities they do revolve around that concept. Similarly, there’s a hipster couple which does dancing, talking on the phone, cycling etc. So whichever makes sense to your story line you can pick them. You have a timeline at the bottom of the screen. You need to add characters, text, and music in a smooth movie like transition. Don’t worry it takes time to master it…but you can always use the play button to edit it back and forth. Next, you have screens on the right side below the upgrade button. Those are your movie screeens which help you to move from one page to another. Once you have made all your screens, and added the music. You can go ahead and download the movie. Animatron allows for videos to be downloaded for a maximum of 10 seconds only. That is for a free account. Now, in my case, I didn’t know about this till the point I was ready to save, and it was a big setback. But there is a way around it. What you can do is, make 10-10 second clips and save it separately on your pc. Then use IMovie to put it all together. It works just fine when you do that. After downloading, how to publish? Once you’re done downloading the video onto your pc, you now want it available on whatsapp or messenger to share it with your friends and family. The easiest way is to first publish it on YouTube. Make a channel for yourself and then publish the video. One thing you need to watch out for is the copyright music. The song that I have put in the video, that’s not free to use. YouTube pretty much mutes the music if you just publish the video as it. So what you have to do is go to audio settings, and agree to some of the terms that come with the copyright music. Once you do that you’re good to go. Fashion Blogger Aayushi Bangur’s Wedding Photos Is Oh So Gorgeous!